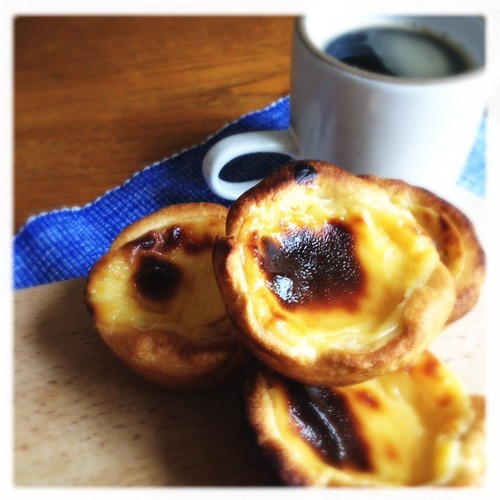 A colleague of mine who is aware of my pastry inclinations has asked several times for me to make these little delightful Portuguese tarts, and I have always fobbed him off a bit, saying that I do pastry, but I don’t do Portuguese pastry – I am a Francophile, with British and American tendencies. But I got to thinking that it could be a good opportunity to put into practice the puff pastry I learned how to make quite recently in a fantastic class at the Cookery School on Little Portland Street, and well, the filling is just, y’know, custard, so I wasn’t really going to be breaking my neck, was I? It seems so. At least with the puff pastry. Bloody hell. It seemed so straightforward when I was under Ghalid’s tutelage but in my own dinky kitchen, not so much. My first attempt had the wrong proportions of flour and butter. Retrospectively, that was a glaring school-girl error on my part. I should have backed off on the amount of butter I used (250g). I had remembered using a whole block when I was in class, so did so again. But with the flour, I had to do some quick calculations of pounds to grams as the Cookery School’s recipe is irritatingly in imperial measurements (I appreciate the irony of an American saying this), and I got the proportions wrong. It absolutely has to be equal butter and equal flour and I had only 225g of flour. Duh. Anyway, this disproportioned attempt resulted in the butter taking over the pastry and becoming a great mess; the butter sneaking out of folds in the pastry, desperate to escape this shameful bastardization of patisserie. Into the bin it went. Of course, I didn’t have any relief butter to try my hand again, so I made my second shop run of the day, and being the pragmatist I am, along with the butter for round two, I grabbed up some pre-made puff, grudgingly. When I buy this kind of pastry I feel like I’m kind of buying into the premise behind Delia’s Cheats, which goes against the fibre of my being. Really, I feel I’m cheating by cheating. As it turned out, I was glad to have the ready-made puff, because the second attempt was equally a bit rubbish. I leveled up the flour to equal butter. All good there. I started to roll and foolishly began to think ‘ha, got it’… until the butter beat me (again). It kept escaping the folds of the pastry (again) and I only made it to three turns before rolling it up and putting it in the fridge. I may try to make some sort of savory cheesy pastry thing with it later once I’ve recovered from this failed second attempt. Normally, I would have bagged the whole thing (I don’t like losing), but I really wanted to finish the Pasteis, so I took out the pre-made and made a mental note to speak to my therapist about it later. The custard was next. I trolled through many recipes and was pleased to see it seemed quite straight forward. 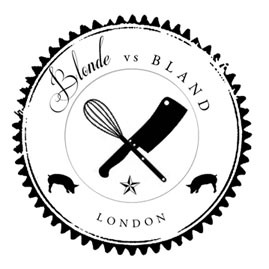 A quick Google search gave Jamie Oliver and Bill Granger’s versions the top hits, but it didn’t seem authentic enough for me (A Brit and an Aussie? Really?). I wanted to find a real recipe from the home of these little delights, Santa Maria de Belém, a small borough of Lisbon, but something authentic turned out to be quite elusive and my Portuguese is unsurprisingly rubbish. So in the end, I opted for Bill Granger’s as the foundation recipe, and tweaked it slightly by adding to the egg/cream/sugar mixture some lemon rind and a couple cinnamon sticks. The custard was made and cooled, and into the oven the Pasteis went. 25 minutes later, they came out looking wonderful and tasting incredible, if I do say so myself: light, sweet, with a wee hint of cinnamon and citrus. The only disappointing thing to me was the pastry. Ready-made puff is not nearly as light as the homemade stuff and I think it tastes a bit heavy for the custard in this instance. Perhaps filo would be a good substitute and one to bear in mind in future. I think I’ll leave my foray into Portuguese pastry here for now. I’m more interested in the elusive puff pastry anyway and my competitive nature means I am now desperate to master it. 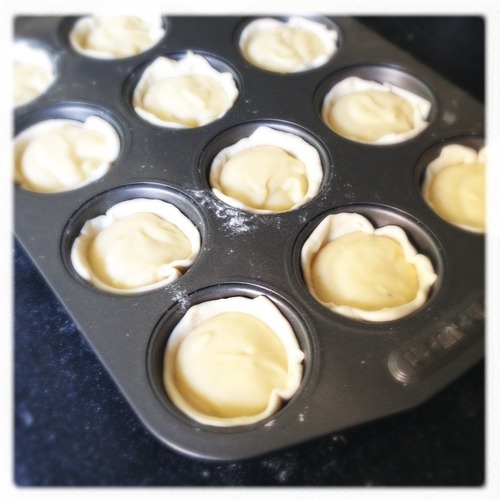 I’ve looked at recipes for rough puff pastry, which seem a half-way house between Jus-Rol and the real deal, but being the perfectionist I am, I doubt that’ll be enough. I may give Ms Mathiot’s version a go, followed by Julia’s. One would think, by round ten, I should get the hang of it, but just in case, keep the filo on standby. Its been a little over a week since my last proper post, so apologies. Its been a bit crazy for me lately (mostly in my own head), so I’m trying to get myself back into a state of normality and sensibility and what other way to do that than the therapeutic act of putting your thoughts out into the world… ahem. If you’ve been following the photos I posted over the last few weeks, you will see that I’m spending a fair amount of my time these days baking. In fact, what I am trying to do is teach myself pâtisserie. Those that know me personally know I have a slightly unhealthy interest in France and the French, which borders on obsession. This is especially weird for an American. The average Yank has kind of a sniffy attitude towards the French in the same way geeky school girls roll their eyes at the popular girls. We kind of hate them, but we secretly wish to be a bit like them too. However, I unabashedly love France. I love its joie de vivre, its art, its towns and villages, its language and its people (yes, even in Paris). But what I love more than anything is its food. My god. The food. It has always bothered me, with this mass influx of low-fat/low-calorie/gluten-free eating that has infiltrated our culture, that people seem to forget that the French live on butter, cream, wine, red meat, white sugar and bread and they are healthy. It is because they treat eating with respect and moderation. It is because to them, food is about more than filling a hole; it is about lifestyle, it compliments friendships and to those with an innate sense of taste, gives true pleasure. And really, is there anything better than sitting in a café on a nice day (they do exist! ), with a cherished friend or partner, eating some wonderful concoction made of butter, eggs, sugar and flour, complete with a cup of coffee, and just being together and enjoying it and each other. Lovely. But this isn’t wholly a romantic obsession, you see. The cook in me is fascinated with the technicality of pâtisserie, which is why I have started down this self-educating path. I am following the advice of Ginette Mathiot via her book The Art of French Baking and I’m not going to lie: it’s tricky. Well, it’s tricky for me, because I am a kinaesthetic learner; I learn by doing. Just reading about something doesn’t work for me; I have to do it with my hands to really get it. 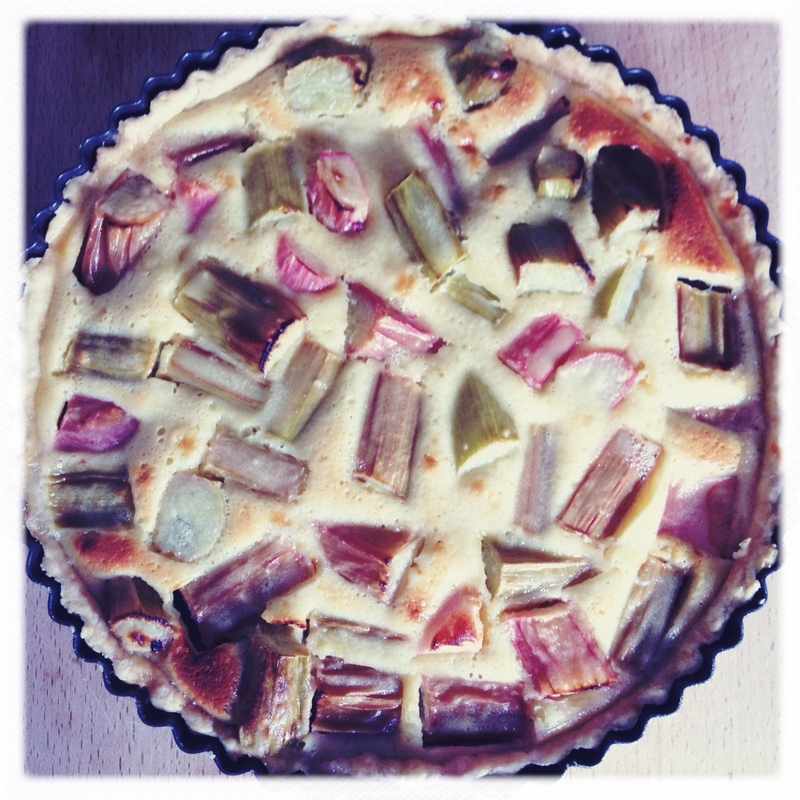 So lesson one is a rhubarb tart. Those lovely stalks are now in season, and thus begins the attempt at Mathiot’s recipe for pâte brisée (shortcrust pastry). Oh how I have fussed in the past about making pastry. Will it be flaky enough? Does it have the right mouth feel? Please god, don’t let it go soggy! Everyone says the trick is to keep the butter and your hands cold, and that is true, but the usual advice of rubbing the butter and flour together until they look like porridge oats is unnecessary. Leave a few larger pieces of butter in there; it won’t matter because as it turns out, the more butter there is, the finer the pastry. 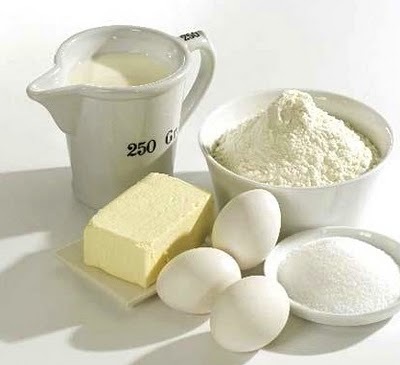 Her recipe also adds a tablespoon of sunflower oil to the cold butter, flour and salt. This was something I’d not done before. Wasn’t pastry just supposed to be flour, butter, a bit of salt and some water? I felt a bit naughty deviating from this holy grouping. But in the quest to learn, I followed the master’s instructions. Another widely accepted piece advice is to not over work the ingredients, so may I advise you to use your hands when bringing your ingredients together. I gave up using a food processor to make dough a few years ago because I liked having the power in my hands to really feel it; to know via touch when it had got to just the right point. The food processor moves too quickly and you greatly risk pushing the butter/flour mixture further than it should be before adding the water. Once everything is mixed together, let the dough chill for as long as possible. 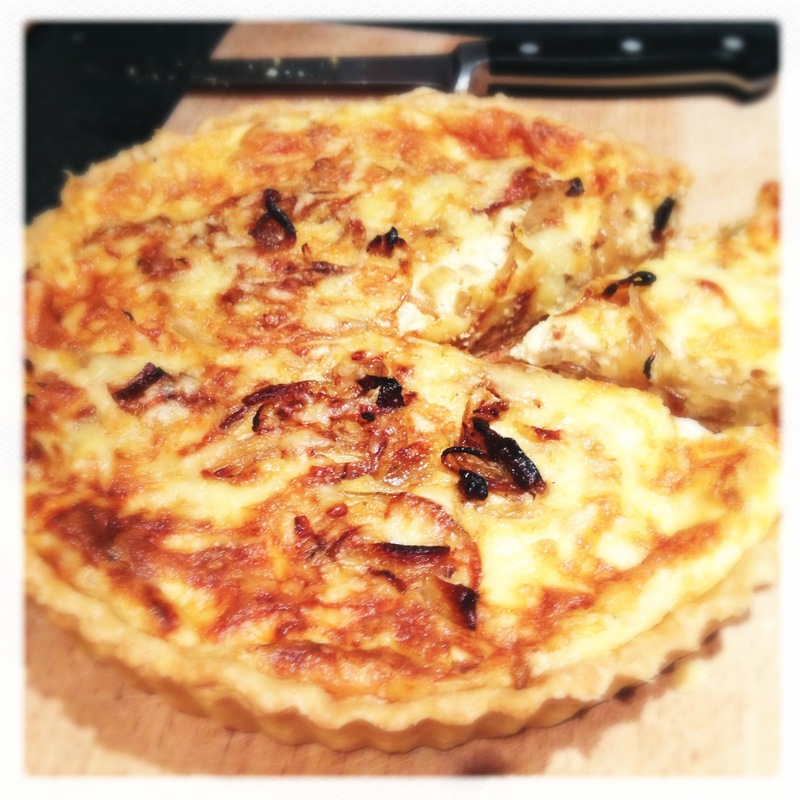 Mathiot recommends over night, but as us busy London folk have little time, I only let it rest an hour in the fridge before rolling it out and filling it with fat chunks of rhubarb and a crème fraîche-based custard. Turns out, the master is called thus for a reason. The results were stunning. The pastry was pliable when rolling it out; light and flaky after it was baked. A perfect support for the tangy and marginally sweet filling. With this technique now burned on my brain, I must fight the urge to make everything with shortcrust. In true French style, moderation is key, and it does me no good to stick with the one thing out of this book I can now make with ease and confidence, which leads me on my next adventure in my tiny kitchen: choux… but more on that at another time. Enjoy the weekend. Happy pastry making everyone.